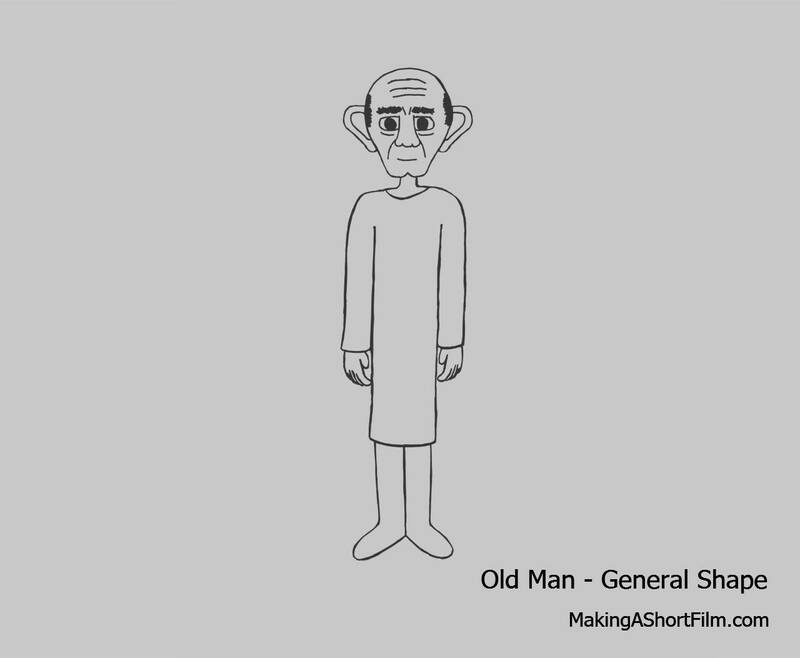 After finishing the Robot design (concept-wise), it is now time to focus on the next character, namely the Old Man. As with the Robot, I will start with trying to find the general shape of the character first, before moving in on any detail. I have known for a very long time that I want his body be extremely straight, like a stick figure without any curves whatsoever. His entire body should have the shape of a thin rectangle, with a rather large cartoon head on top. Also he should be relatively short, combined with a thin body to give him very little mass. This will have several effects that I am after. First it will make him look physically weak, which makes him more of a victim under the Doctor. It will also make him look sicker, which makes it more understandable that the doctor doesn't let him out. This is important so you understand why the antagonist does what she does, otherwise she's in the risk of just seeming evil. Lastly, this body shape will also give a clear contrast towards the large and round Robot, making them visually very different, and therefore not apparent friends. 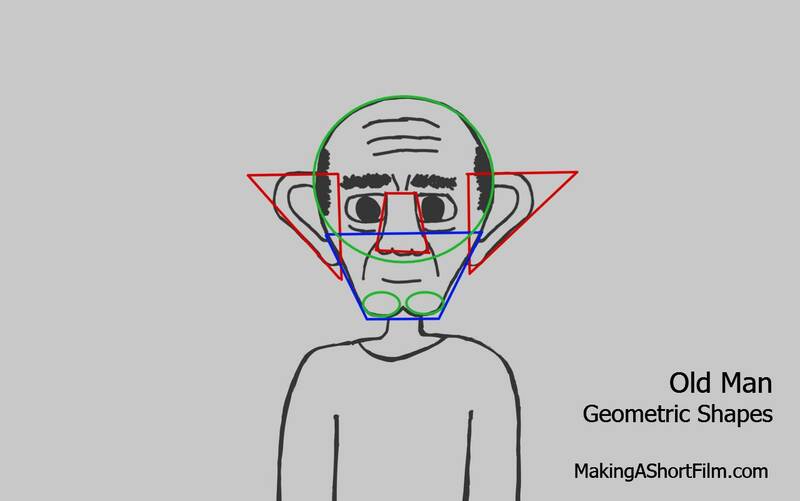 So to summarize, he will have a small frame, (the bone structure of a small person), as well as being thin, making the bones in his body more visible. Since I was very clear about the simple body shape I was looking for, I could draw that right away. Instead, it was the more precise shape of the head that was harder to nail down. I wanted him to have a cartoony look with relatively large eyes. 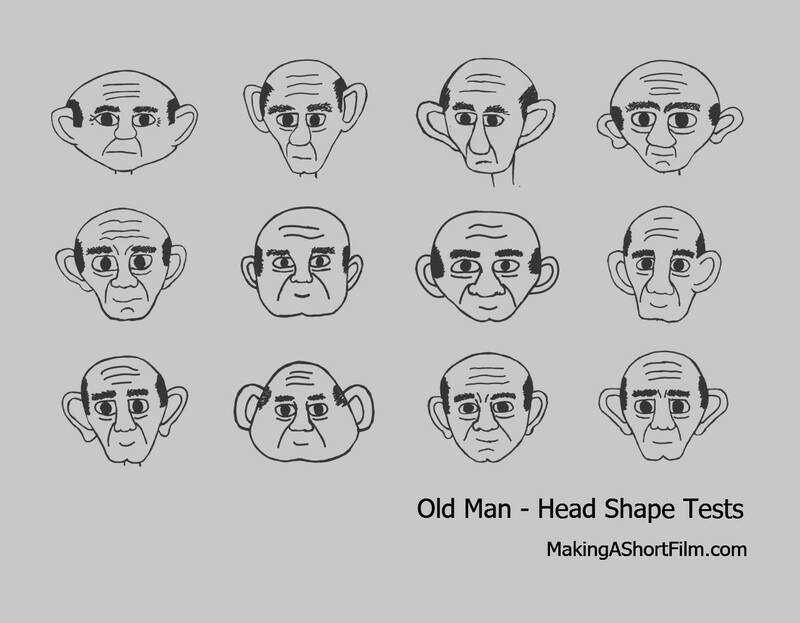 I also wanted him to have large ears and nose, which older people often have, as well as being almost bald with a lot of wrinkles. So, I drew several head suggestions (visible in the image up top), and attached them to the body to try and see which one I liked the best. I settled for variation #12, the one in the bottom right of the image. I like a few key features of that head. First of all, I like the triangular ears. I also like the wide, large nose, making it quite rectangular. Lastly I like the cleft chin, as well as the overall shape of the skull. So as I refine this design further on, I will keep those key characteristics. Please tell me what you think about it in the comments below! And if you are curious, in the original image file available for download below, you can easily toggle the different heads to see how they look attached to the body. Until next time, I will refine this drawing to include all the details and final shape of everything. This includes designing the clothing worn by him, as well as more details everywhere (like wrinkles).